O restaurante tem um serviço excelente. A localização é super agradável e aconchegante. Where to find Buzios hotels near an airport? How can I find hotels in different Buzios neighborhoods? Where can I find hotels in Buzios that are near tourist attractions? Planning a trip to Buzios? There's a broad selection of hotels to choose from. Spend some time exploring Expedia's 169 hotel listings, all of which can be found within a 0.1-kilometre (0.06-mile) radius of Buzios' city center. Buzios offers visitors a range of centrally located lodgings, including the Hotel El Cazar and Armacao dos Buzios Pousada Design. Cabo Frio is a popular hotel neighborhood. Cabo Frio is 19 kilometres (12 miles) from the main part of Buzios and boasts 41 hotels. 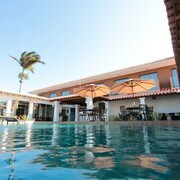 The Pousada Mar de Cabo Frio and Pousada Jataí are some places to base yourself in Cabo Frio. 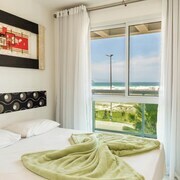 Other areas with a range of hotels are Saquarema and Arraial do Cabo. 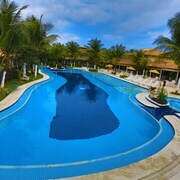 The Hotel & Spa Laje de Itaúna and Itaúna Hostel are in Saquarema, while Arraial do Cabo is where you'll find the Ocean View Hotel and Pousada Recanto das Tartarugas. 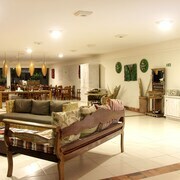 The Travel Inn Quari Quara and Pousada do Marujo can be found in Rio das Ostras, and Perola Buzios Hotel and Búzios Beach Internacional Apart Hotel are part of the Rua das Pedras area. The Geriba Beach is one of the more popular attractions in Buzios. The Insolito Boutique Hotel and Pousada Pedra Da Laguna are all nearby. The Casagrande Hotel Boutique and the Aguazul are within a short walk from the Bones Beach, while the Rio Buzios Boutique Hotel and Trópico de Capricórnio are situated near the Azeda Beach. The Joao Fernandes Beach and the Ferradura Beach are two other popular Buzios attractions. 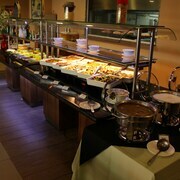 The Colonna Park Hotel and the Hotel Atlantico Buzios Convention and Resort are near to the Joao Fernandes Beach. While the Le Relais La Borie and the Serena Buzios, are close to the Ferradura Beach. If you have a limited budget and are simply hoping to find mid-range or low-budget Buzios hotels, we also have quite a few affordable hotels to consider in the vicinity. The Pousada dos Tangaras is 4 kilometres (2 miles) from the center of Buzios, while the Pousada Aquarium is 2 kilometres (1 mile) away. The Baía do João Pousada and the Pousada Jataí are two of the other recommended lower-cost accommodations worth checking out. 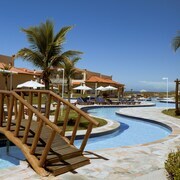 5 kilometres (3 miles) from the heart of Buzios, is the Blue Tree Park Búzios Beach Resort. The Vila d'este handmade hospitality hotel is positioned 0.9 kilometres (0.6 miles) away. Some other accommodation options include the Byblos Pousada and the Pousada dos Buzios. If time allows, you could visit other parts of the Southeast Region region. Investigate Southeast Region's traditional villages and cathedrals and enjoy the region's beaches. Travelers in this part of Brazil enjoy mountain climbing and hiking. 30 kilometres (17 miles) to the southwest of Buzios you'll find Arraial do Cabo, where you can enjoy Independence Square and Prainha Beach. 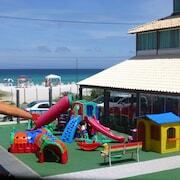 If you'd like to stay in Arraial do Cabo, check out the Pousada Caminho do Sol and Pousada Porto Praia. Or, you could stay in Nova Friburgo, 80 kilometres (50 miles) to the northwest of Buzios, where you can pick from the Hotel Fabris and Hotel Serra Everest. The Nova Friburgo Country Club and Stone of Catarina are just a couple of the more popular attractions to experience should you visit Nova Friburgo. Macaé Airport is a practical airport, and is 50 kilometres (30 miles) away from Buzios. 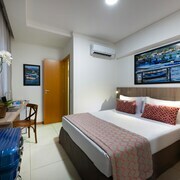 Accommodation options nearby include Macae Othon Suites and Personal Hotel. What are the most popular Buzios hotels? Are there hotels in other cities near Buzios? What other types of accommodations are available in Buzios? Explore Buzios with Expedia.ca’s Travel Guides to find the best flights, cars, holiday packages and more!